This bandish was my attempt at evoking a question and answer within composition. Gauri is a contemplative raag and kalyan evokes the feeling of oneness with God. The first line of each antara is in Gauri and the second line is in Kalyan. For example asking the question, 'how does one remove grief from one's life' is in Gauri, and the answer 'sing the praises of God' is in Kalyan. This recording was done in 1997. 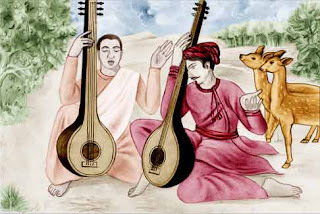 The Sthayee bandish comes from my Guru, Pandit Raghunath Prasanna and is likely an old Banaras Gharana bandish. Following is a compilation of shabads, grouped by raags, which was made by made by Sardar Santokh Singh ji from Malaysia as of July 2007. This compilation was started by Santokh ji as part of a discussion thread, "Kirtan with English sub-titles," on sikhphilosophy.net. I have been meditating on this shabad "Mere Lalan Ki Sobha" for the past month or so. And because you are my saints, to understand this better, I need your perspective on this shabad. I want to know what this shabad says to you. I would be grateful to you if you can share your perspective about this shabad or answer one or more of the questions either in the comments on this blog or by email (shivpreetsingh @ live . com). 2. How is the rahao tuk connected to the Mool Mantra? 3. Why is this shabad in Raag Kalyan? 4. What does this Shabad say to you? Any personal perspectives? 5. What is the point of mentioning several dieties (Brahma, Mahesh etc.)? How is this connected to the rahao tuk? 6. In the end Guru ji says "I am a sacrifice to the Saints, who are the Eternal Companions of God"? How is this related to the rahao and mool mantra? I wanted to know which key should be chosen as "Sa". The person who teaches me raaga ... is teaching "Sa" as the 4th black key. The [person] who teaches me shabads doesnt know any raagas but is using "Sa" two black keys even further.